Properties with commercial mortgages will also need to consider how any proposed rent reductions would impact lender-required rent minimums and whether the decreased payments or vacant space would affect the Debt Service Coverage Ratio stipulated in the loan documents. If a technical default is triggered, would the property owner be able to pay down the loan in order to cure such default? Absent some sort of settlement, mattress store tenants that default on their lease payments are opening themselves up to lawsuits. Bear in mind that any judgments that are obtained will make the landlord a higher-level creditor in any subsequent bankruptcy, but that may only yield a fraction of what is owed depending on the financial strength of the company. Those who agree to a discounted rent only to see the tenant file for bankruptcy and shutter the store anyway will be granted a liquidation payment under the U.S. bankruptcy code. Those who decide to move forward with a revised rent structure should ensure that the concession is structured as a rent abatement and not a restructured rent payment method. They should also add a provision stipulating that if the store closes for more than 60 days or if the tenant defaults under the lease in any way, the abatement is terminated, the abated rents are due and payable, and the rent reverts back to the original sum in the ensuing months. 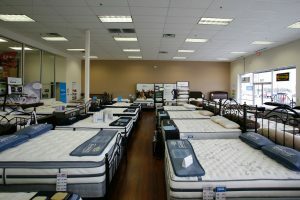 In addition, the rent abatement should apply only to the mattress store tenant for its current use of the space, and it should revert back to the original lease terms if the tenant changes the use or sublets the space to a different company. The contraction of the mattress store sector in retail appears to be only now beginning. By conducting a thorough financial analysis and employing these suggestions when faced with a concession request by an operator, property owners will be able to mitigate the consequences and achieve the best possible outcomes.